intrpStress = interpolateStress(structuralresults,xq,yq) returns the interpolated stress values at the 2-D points specified in xq and yq. For a dynamic structural model, interpolateStress interpolates stress for all time-steps. intrpStress = interpolateStress(structuralresults,xq,yq,zq) uses the 3-D points specified in xq, yq, and zq. intrpStress = interpolateStress(structuralresults,querypoints) uses the points specified in querypoints. 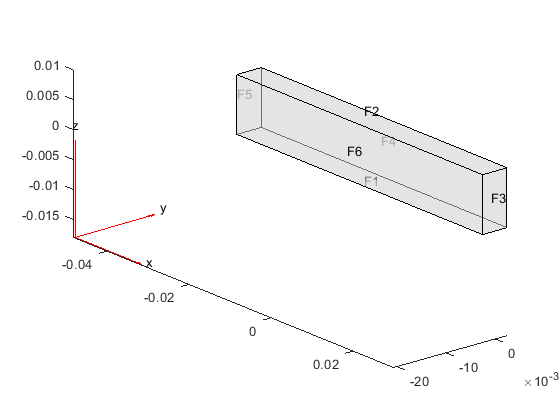 Create a structural analysis model for a plane-strain problem. Include the square geometry in the model. Plot the geometry. Specify the Young's modulus and Poisson's ratio. Specify the x-component of the enforced displacement for edge 1. Specify that edge 3 is a fixed boundary. 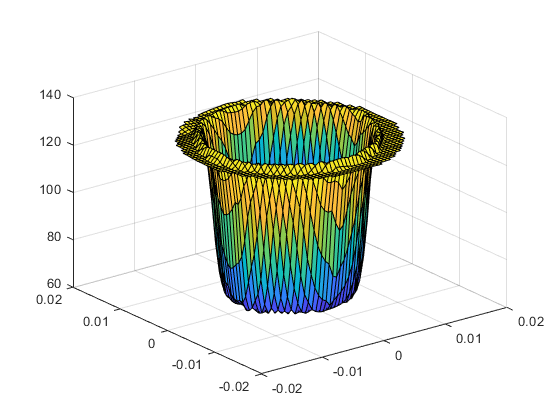 Generate a mesh and solve the problem. Create a grid and interpolate the x- and y-components of the normal stress to the grid. Reshape the x-component of the normal stress to the shape of the grid and plot it. 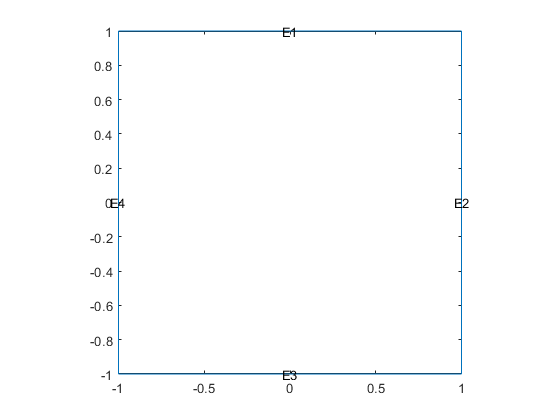 Reshape the y-component of the normal stress to the shape of the grid and plot it. Solve a static structural model representing a bimetallic cable under tension, and interpolate stress on a cross-section of the cable. 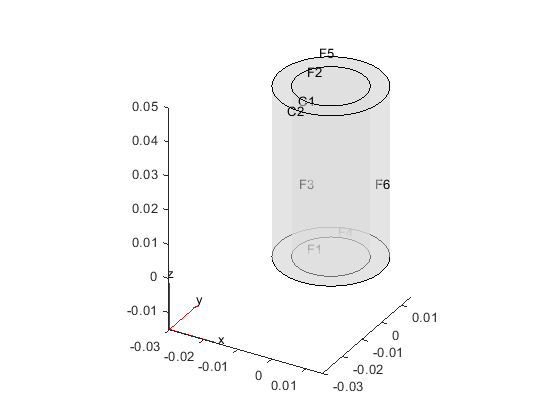 Create a static structural model for solving a solid (3-D) problem. Create the geometry and include it in the model. Plot the geometry. Specify the Young's modulus and Poisson's ratio for each metal. Specify that faces 1 and 4 are fixed boundaries. Specify the surface traction for faces 2 and 5. Define coordinates of a midspan cross-section of the cable. 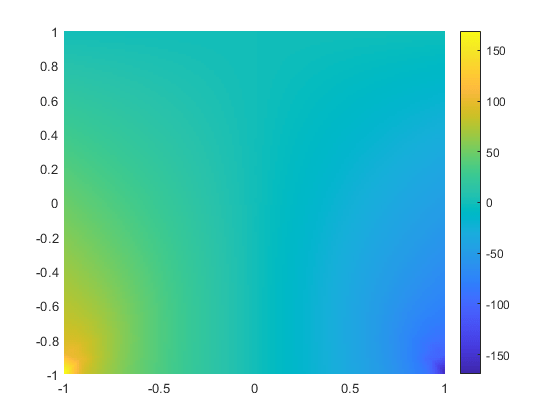 Interpolate the stress and plot the result. Alternatively, you can specify the grid by using a matrix of query points. Interpolate the stress at the geometric center of a beam under a harmonic excitation. 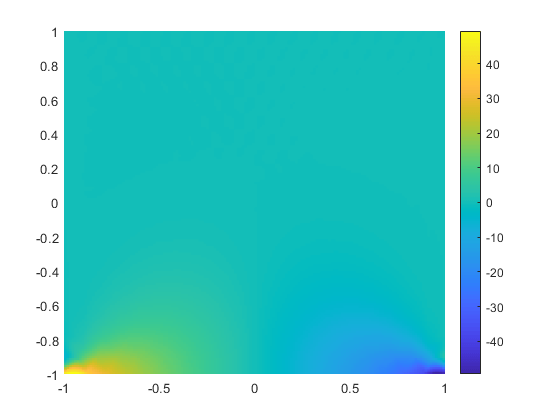 Create a transient dynamic model for a 3-D problem. Create a geometry and include it in the model. Plot the geometry. Specify the Young's modulus, Poisson's ratio, and mass density of the material. Fix one end of the beam. Apply a sinusoidal displacement along the y-direction on the end opposite the fixed end of the beam. Specify the zero initial displacement and velocity. Interpolate the stress at the geometric center of the beam. 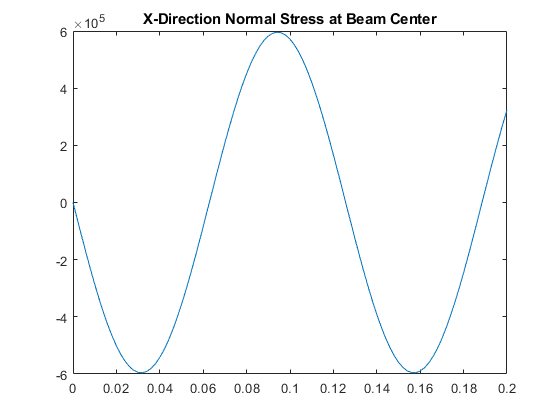 Plot the normal stress at the geometric center of the beam. Solution of the structural analysis problem, specified as a StaticStructuralResults or TransientStructuralResults object. Create structuralresults by using the solve function. x-coordinate query points, specified as a real array. interpolateStress evaluates the stresses at the 2-D coordinate points [xq(i),yq(i)] or at the 3-D coordinate points [xq(i),yq(i),zq(i)]. Therefore, xq, yq, and (if present) zq must have the same number of entries. interpolateStress converts the query points to column vectors xq(:), yq(:), and (if present) zq(:). It returns stresses as a structure array with fields of the same size as these column vectors. To ensure that the dimensions of the returned solution are consistent with the dimensions of the original query points, use the reshape function. For example, use intrpStress = reshape(intrpStress.sxx,size(xq)). y-coordinate query points, specified as a real array. interpolateStress evaluates the stresses at the 2-D coordinate points [xq(i),yq(i)] or at the 3-D coordinate points [xq(i),yq(i),zq(i)]. Therefore, xq, yq, and (if present) zq must have the same number of entries. Internally, interpolateStress converts the query points to the column vector yq(:). z-coordinate query points, specified as a real array. interpolateStress evaluates the stresses at the 3-D coordinate points [xq(i),yq(i),zq(i)]. Therefore, xq, yq, and zq must have the same number of entries. Internally, interpolateStress converts the query points to the column vector zq(:). Query points, specified as a real matrix with either two rows for 2-D geometry or three rows for 3-D geometry. interpolateStress evaluates stresses at the coordinate points querypoints(:,i), so each column of querypoints contains exactly one 2-D or 3-D query point. Stresses at the query points, returned as a structure array with fields representing spatial components of stress at the query points. For query points that are outside the geometry, intrpStress returns NaN.